Well, our Art Class is finished for the summer. We had a lot of fun and the students enjoyed creating their own paintings. Since we didn't have class on July 4th, I gave them a choice of two paintings to do on our next class. A house or a flower garden. Most chose the flower garden, but not all. So I was tasked with doing two paintings in one class. The house was to practice the perspective, just like I posted. Today was the last class and we painted a Florida lighthouse. Again, it taught perspective and we added the techniques for grass and dirt, and more practice on painting clouds. The flower garden from a couple weeks ago turned out quite nicely! It was an impressionistic painting and so much fun and I do believe that each painting was quite good! Yes I have a photo below of the painting. You really should try it yourself. 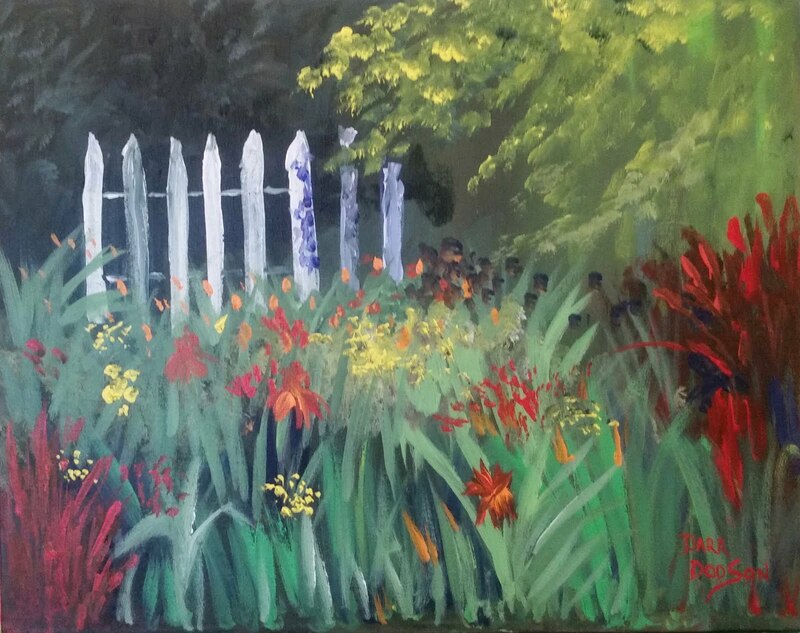 It is a good lesson in loosening up in your strokes and striving for a fresh look in you paintings. Something that is good for all artists from time to time. I decided to use last week's class to teach the students how to transfer a drawing to the canvas before painting. I showed them how to fold the drawing into 16 boxes then taking a T-square or yardstick making a large X on the paper to establish the middle, then how to mark those boxes on a larger canvas and thus transfer the contents of each "box" onto the canvas. It sounds complicated, but it really isn't. But, it is a skill that is necessary for any artist to have. I'll try to post on it soon, OK? Also, I gave each one a small 2" magnet painting as a gift and a review questionnaire to fill out. I wanted feedback on how they liked the class and if they had any suggestions on what they would like to learn in the future. I quite enjoyed their comments. It was interesting. only a couple of students had suggestions for extra work. One wanted practice in contrast and the other in color mixing. Both of these skills are more intermediate in level. I will definitely take them into consideration for the next class which will start this fall. I thoroughly enjoyed the opportunity and will definitely teach classes again! I ended up with eight students, and even though some missed a class or so, those who made every class went home with four paintings. A great accomplishment for only 12 hours of instruction! 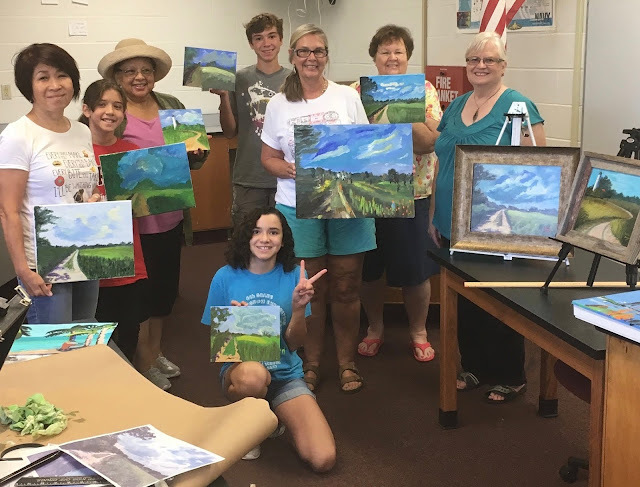 The Community Education forum is a great way to learn to paint at a minimal cost, students can observe, practice, and learn from others, and make new friends as well!